There is not much information available about Heinz Schroeder, born January 06th 1920 in Rendsburg. During the Soviet offensive that started near Jelnja on August 7th 1943, Heinz Schroeder as 1st Lieutenant and battery commander of 4th / Artillery regiment 260 led the fire from his forward observation point close to the front line. During the hand to hand combat, that developed he fought side by side with the infantry and destroyed a tank in heavy defensive fire after 4 attempts. 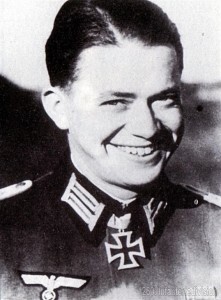 During the defensive fighting, Captain Schroeder distinguished himself with determination and highest courage. For this bravery, he was awarded the Knights Cross on November 4th 1943.